A breakthrough change in mining is near with the go-ahead given to build the world’s first deep ocean mining ship. BY LINDSAY CLARK. The pioneering deep ocean mining company Nautilus Minerals plans to begin mining by 2017. It is chasing rich grades of copper, gold, silver and zinc from a volcanic-origin in 1600 metre-deep ocean off the coast of Papua New Guinea. Nautilus is headed by two mining entrepreneurs with strong Kiwi connections, Geoff Loudon, the chairman of the company who lives in Christchurch, and chief executive Mike Johnston, a geology graduate from the University of Canterbury. Loudon told the AusIMM New Zealand minerals conference in Hamilton recently that he was one of the three founders of Nautilus 19 years ago. Developing minerals underwater could also lead to changes to how we mine on land, because modern openpit mines can leave scars on the landscape sometimes occupying tens of square kilometres. Loudon says the average grade of metals found in mineral ores around the world has fallen rapidly in the past 20 years. More rock has to be dug to get the same amount of metal. “Mines can’t go on for ever getting larger and larger,” he says. Nautilus Minerals’ first mine, Solwara-1, lies 30 kilometres from the nearest coast, over 200 kilometres from the Papua New Guinea (PNG) mainland between two of its large offshore islands, New Ireland and New Britain. But the Solwara-1 deposit is tiny, only occupying 11 hectares. Yet this deposit will be able to produce 100,000 tonnes of copper per year and about 100,000 ounces of gold, plus silver and zinc. A mine on land with this production would usually cover many square kilometres. What attracted Nautilus to Solwara-1 was the very high grades. The eight percent copper grade is 10 times higher than average, while gold grades at six percent instead of the average 1.5 percent grade. Such high grades should make the project highly profitable. There is no costly overburden to remove. Ship-based mining also gives the mobility to “move a mine” to a new location. There are no sunk costs to dig a new mine. Just pull up anchors and sail away with plant, workers and accommodation to the next location. Loudon says the ore at Solwara-1 will be worth about $1000 a tonne. Mining, smelting and processing costs will be about $700 a tonne, leaving a healthy margin of around $300 a tonne. The billion-dollar project will take about three years to pay back. Such mineral deposits are known as seafloor massive sulphides or SMS. They are only found in deep water mostly near plate boundaries where there has been volcanic activity. 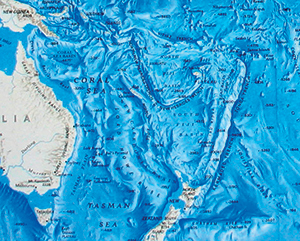 About 900 SMS deposits are known to occur, mainly around the Pacific Ocean’s “ring of fire”. It is believed about 6000 such deposits may occur under the sea. The deposits form from super-heated, acidic hot springs which carry metals dissolved from the earth’s crust. As soon as the hot mineralised water in the “black smoker” vents hits the cold ocean water, the metals solidify into small rocky chimneys. Beds of these collapsed black chimneys form the SMS deposits. Nautilus has been prospecting off islands in the south-west Pacific for many years. 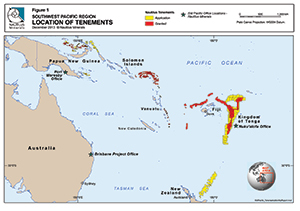 The company holds tenement areas totalling 450,000 square kilometres in the Solomons, Fiji, Vanuatu, Tonga and New Zealand (Nautilus has an application for a 50,000 square kilometre permit along the Kermadec Arc from the Bay of Plenty towards the Kermadec Islands). 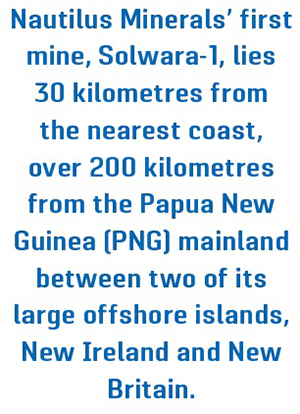 But the company is likely to focus on PNG waters over the next few years with more developed prospects there. Both Loudon and Johnston have many years of exploration experience in PNG. Nautilus is a truly international project. It is headquartered in Toronto with an operations office in Brisbane. Its biggest financial backers are Omani oilfield services billionaire Mohammed Al Barwani and Russia’s richest tycoon Alisher Usmanov’s Metalloinvest Holding, who together own 40 percent. UK-South African mining giant Anglo-American also holds a substantial stake. Nautilus will charter a specially designed mining ship to be built in China which is some 230 metres long. The ship will serve as the operational base. 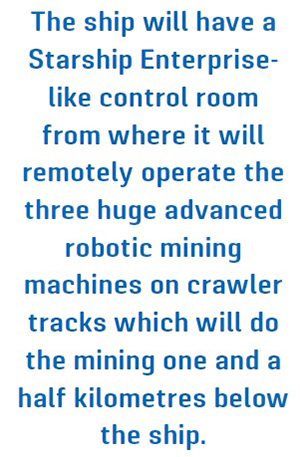 The ship will have a Starship Enterprise-like control room from where it will remotely operate the three huge advanced robotic mining machines on crawler tracks which will do the mining one and a half kilometres below the ship. These British-built mining machines are together worth $100 million. The mine control ship, currently in an advanced stage of planning, will lower by cranes three huge remotely-controlled mining machines down 1600 metres to the deposit. The machines, together worth $100 million, will crush and scrape the SMS ore. The rock will be pumped as a slurry up a riser pipe onto the ship for storage. Ore freighters will pull up alongside the mine ship to load the ore destined for a metal processing plant in China. “This might sound like a science fantasy by Jules Verne,” Loudon says. But every bit of the underwater equipment is currently used by the oil and gas industry to dig trenches across the ocean bottom so pipes can be buried, he says. The mining machines and riser are more than half built, ready to be attached to the ship for lowering to the sea bottom deposit. Loudon’s reference to a Jules Verne fantasy is interesting. Nautilus is the name of the submarine which travels 20,000 Leagues Under the Sea in the famous French writer’s 19th century book of the same name. In the story Nautilus comes to grief on a reef off New Guinea. The modern Nautilus project is all about turning what would once have been a mining fantasy into tomorrow’s reality.